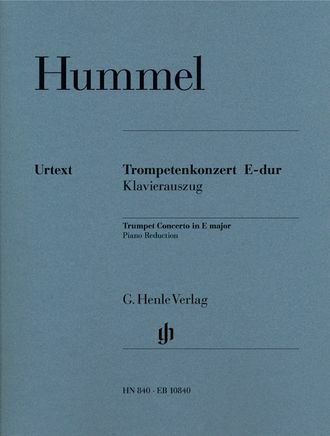 Hummel’s Trumpet Concerto is still one of the most popular concertos for this instrument. He composed it in 1803 for the Viennese court trumpeter Anton Waidinger, whose newly developed key-trumpet enabled him to play in a much more virtuoso manner than on the traditional natural trumpet. Our Urtext edition reproduces the work in the original key of E major with solo parts in E and for the more common trumpet in C. Due to the fact that the concerto is nowadays often performed in E flat major, our edition also contains a piano reduction in E flat major for trumpets in E flat and B flat. The different transpositions are now available in one single edition for the first time. Breitkopf & Härtel are publishing the performance material at the same time.